Kabir (Rohan Gandotra) is a struggling actor married to a successful business woman from a wealthy family. He dreams of hitting the big time while his wife, Neha (Samvedna Suwalka) only wants him to work within the family business, to provide for their family. She has a heart condition and the stress of Kabir's dreams have been weighing on her. As have the pressures from the family to get him working a straight job. But Kabir has a secret. He's been secretly seeing another woman Carol (Niharica Raizada), who wants nothing more than for him to divorce his wife. If he does that, he will almost certainly be penniless; and that is not an option. The 2 lovers finally decide there is only one solution. To murder Kabir's wife. That way, he'll get all her money and get to be with Carol. But getting away with murder is hard, however Kabir comes up with a plan. With his wife Neha believing he's going on a business trip, to learn her family business, he sets the plan in motion. But all isn't going as planned - especially when Carol drops some very serious news on him. Will Kabir and Carol get away with murder? Vikkramm Chandirramani will let you know - when you watch this excellent short film. Watching The Perfect Murder and knowing it was a micro budget film is one thing. Seeing this film and thinking how good it looks is another. That's right folks. Chandirramani's short film looks great. So much in fact, that there were times I forgot this was a micro film. The shots are clear and to the point and the pacing fits the story perfectly. The acting is fully realized through good audio and yes. The acting is pretty good. The twist on the ending is as ironic as it is funny. Of all the things I thought would happen, that was not one of them. Everything is wrapped up neat and tidy; and there really was a lot of plot in this film. But it never felt bloated or long. 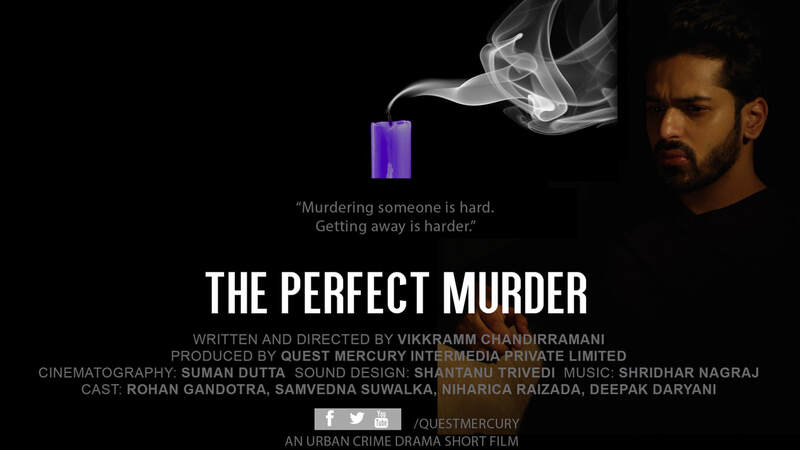 The Perfect Murder seemed to have the perfect run time and perfect pacing. No complaints. It's always a happy day when a micro budget film far exceeds expectations. What's more? This is a sub titled film and sometimes, something gets lost in translation. Not the case with Vikkramm's short film. The acting, story and even dialog comes through cleanly. Despite being sub titled! The cast and production crew have done wonders and I only have one thing left to write. Somehow, grab yourself a bit of a budget and write a feature length movie. I have a feeling it will be excellent.